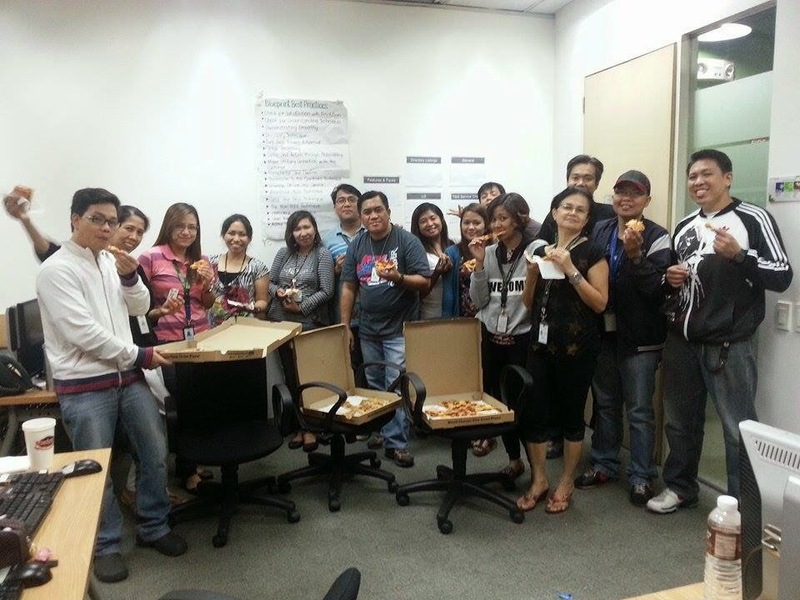 We enjoyed pizza, break time from the training..
Our classroom training for ADSL (asymmetric digital subscriber line) is done. ADSL training in layman’s lingo is simply internet training. My team mates and I underwent two weeks classroom training for us to be able to handle calls from customers having trouble with their internet. Before the training we support residential home phones and satellite televisions. We make sure to trouble shoot with customers before dispatching a tech. This is to avoid possible charges in case the trouble is on the equipment of the customer or an overlooked inside wiring issue. We work for a Canadian company, technicians charge hefty sum of one hundred dollars. I kind of got dizzy trying to decipher all those initials and tech terminologies yet my confidence I would say is above and beyond. Some of these tech terminologies are DSLAM, HDM, DNS, IMAP, SMTP, MAC address, IP address, attenuation and many more. Not to mention the different brands of computers, operating systems, gateways and modems. I do not have a formal education in computer. Thanks to my youngest brother and his wife for pushing me to learn this machine. I was able to get the hang of the machine by learning on my own. Now, I am a tech support for internet. Great! I was kind of relaxed while taking calls for about four days after the training and exam. My calls were mostly trouble shooting for home phone and satellite television. Some of the calls I had to dispatch a tech to fix the trouble. I received two calls on internet issues, outage calls, piece of cake. Friday, the 22nd an hour before the end of my work shift was my first challenging internet call. It was from a Chinese gentleman, new install. The tech left after connecting to internet his desktop and two laptops. His trouble was he cannot connect his tablet and printer to his wireless, Wi-Fi. The customer was giving me all sort of numbers from the gateway, user name and password but none of them worked. He was saying our tech wrote on a piece of paper the network user name and password but to no avail as we tried them. I was telling myself, “I knew this, I knew this!” as I peppered the customer with questions. I was buying time as I fumbled for the right tool where to find his network user name and password. He was already raising his voice. I cannot tell him he was my first call for internet issue. Pride and dignity, you know. I was drowning! I waived my right hand to our floor coach who right away rescued me from drowning. The floor coach showed me exactly where to look for the missing piece of puzzle. I tried to ask the customer to follow my lead but he could not get what I was saying. Good enough he agreed I logged in to his computer so I can guide him what to do. LMI (log me in) is a way where we can navigate the computer of the customer. Customer has to accept an agreement before we start the process for security reason. He was following as I navigated his computer. I showed him where to look for his network user name, and password. Finally, he was happy to be able to connect his tablet and printer to Wi-Fi. I sent him email on how to change his password. He knew I am a Filipina, my accent gave me away, I am not Canadian. He said “Salamat”, thank you in English, we both laughed. I ended the call with a wide grin!